I’m Rich Neste, the managing broker at Foundation Realty. We are a real estate brokerage that is “open for business” 24 hours a day, 7 days a week, and I am proud to say that we have quickly become a real estate powerhouse in the local market in less than three years. We rank in the top 10 for every major sales volume and transaction category in our local Multiple Listing Service. We have a dedicated staff of knowledgeable Realtors and sales professionals. How did we get to be so successful in such a short period of time? One word sums it up: T-E-C-H-N-O-L-O-G-Y. We use the most innovative technology to properly serve our clients with all of their real estate needs. Think about it for a second. We now live in a microwave world where we want everything in a matter of seconds. Gone are the days of waiting around for a monthly newsletter or real estate magazine for the latest property updates or market trends. As soon as something is printed, it is out of date. According to the National Association of Realtors, 90 percent of all real estate transactions in 2010 originated online. 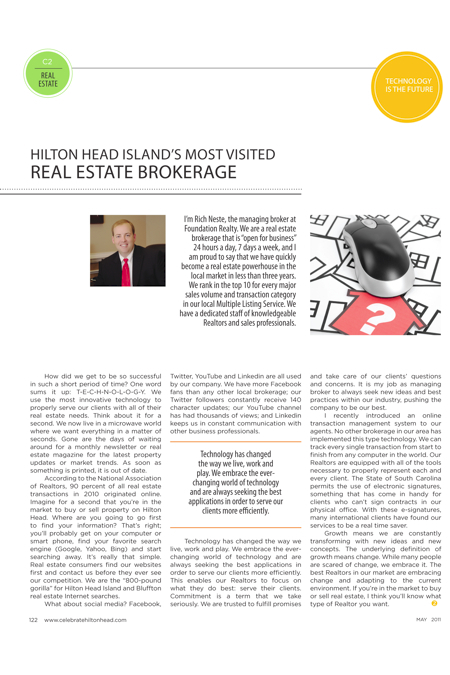 Imagine for a second that you’re in the market to buy or sell property on Hilton Head. Where are you going to go first to find your information? That’s right; you’ll probably get on your computer or smart phone, find your favorite search engine (Google, Yahoo, Bing) and start searching away. It’s really that simple. Real estate consumers find our websites first and contact us before they ever see our competition. We are the “800-pound gorilla” for Hilton Head Island and Bluffton real estate Internet searches. What about social media? Facebook, Twitter, YouTube and Linkedin are all used by our company. We have more Facebook fans than any other local brokerage; our Twitter followers constantly receive 140 character updates; our YouTube channel has had thousands of views; and Linkedin keeps us in constant communication with other business professionals. Technology has changed the way we live, work and play. We embrace the ever-changing world of technology and are always seeking the best applications in order to serve our clients more efficiently. This enables our Realtors to focus on what they do best: serve their clients. Commitment is a term that we take seriously. We are trusted to fulfill promises and take care of our clients’ questions and concerns. It is my job as managing broker to always seek new ideas and best practices within our industry, pushing the company to be our best. I recently introduced an online transaction management system to our agents. No other brokerage in our area has implemented this type technology. We can track every single transaction from start to finish from any computer in the world. Our Realtors are equipped with all of the tools necessary to properly represent each and every client. The State of South Carolina permits the use of electronic signatures, something that has come in handy for clients who can’t sign contracts in our physical office. With these e-signatures, many international clients have found our services to be a real time saver. Growth means we are constantly transforming with new ideas and new concepts. The underlying definition of growth means change. While many people are scared of change, we embrace it. The best Realtors in our market are embracing change and adapting to the current environment. If you’re in the market to buy or sell real estate, I think you’ll know what type of Realtor you want.